The Tredegers, father and son, peered through the fog at the Balclutha, the three-masted, full-rigged beauty that was part of the Maritime Museum’s collection. If the moisture burned off enough, his father would try to get a picture of her, caressed just so by the early morning sunlight. As if the sun would ever shine over San Francisco Bay in the morning. He said he knew what that picture would look like when he got it and until that day, their Saturday mornings would be spent in the aquatic park trying. Adin went with him, mostly for the coffee. Adin shivered from what seemed like glacially cold, damp air that lay on them like a blanket. San Francisco was like London, only without the charm of age and the patina of empire to hold his interest and get him past it. “I know that. I believe I mentioned I’m obsessed.” He looked back and saw the shroud of fog still clung to the object of his desire. Adin laughed when two of his father’s students—attractive college girls—jogged by in short shorts, giggling. It was as if they simpered in unison. Keene waved. Adin watched his father’s face. It seemed safe to say he had no concept of their attraction to him. Even at thirteen Adin knew when he saw the spark of sexual interest in someone’s eyes. He’d learned a lot from the far worldlier Edward, whose passion for the Romantic Movement in art was positively exacerbated by his quicksilver moods and an early and fateful reading of the poetry of Walt Whitman. Edward, in whose eyes he saw his own longings clearly and proudly displayed; Edward, who seemed to be an advance scout, a forayer into the hostile territory of adulthood, bringing back information and providing a source of comfort for Adin, who seemed destined to advance at a slower pace. Edward had already informed his family of what he knew to be his truth, and even though Adin was well aware he’d have to make the same declarations someday, he worried that his wouldn’t be met with the same sangfroid Edward’s parents and grandmother—who had known before he did—had displayed. Adin’s eyes rose to meet his father’s. He hid behind his coffee cup and let the steam from the still hot brew rise between them. “Did you see those girls run by?” Keene murmured. Adin felt uncomfortable with the subject and burned under his father’s close scrutiny. Adin’s heart hammered in his chest as his father let out a lengthy sigh. Adin remained silent, his eyes on the rippling water of the bay. The fog was burning off, barely obscuring the horizon. In only moments the Balclutha would be visible, maybe even perfectly lit by the sun that was beginning to peek through the clouds. “Dad.” Adin, filled with a kind of rising panic, ducked behind the camera and looked through the viewfinder. “Me too, son.” His father wrapped an arm around him. Adin swallowed around the stinging in his throat as he opened his eyes. His chest felt all heavy inside, as if suddenly it were filled with wet sand, and dragging enough air into it to breathe was painful. When he could focus he saw Bran sitting next to him on the bed, squeezing his hand. Adin heard the door close with a bang, and the atmosphere in the room changed dramatically. The whispering voice sounds that let Adin know when Donte was near buzzed angrily in Adin’s head. The noise vibrated, emanating from Donte’s whole body and outward into the room like a warning. Adin had only a second to think before Bran was growling as well. Bran responded with an unnaturally feral and uncanny sound, like the roar of a tiger, and he leaped off the bed, crouching by the side of it as if getting ready to defend it. “Stop.” Neither of them paid Adin any attention. “Step away from my human.” Donte’s voice rolled into the room like pyroclastic flow. Vigil is available at MLR Press, Here. As a belated Christmas present, my daughter made me a new book trailer video for the novel Vigil. I can’t tell you how much I love the work she does, and how proud I am to share it here with you! This is one of those things that you stop by and “Like” by clicking that little like button. Every time someone “likes” that page, an angel gets his wings. I promise. 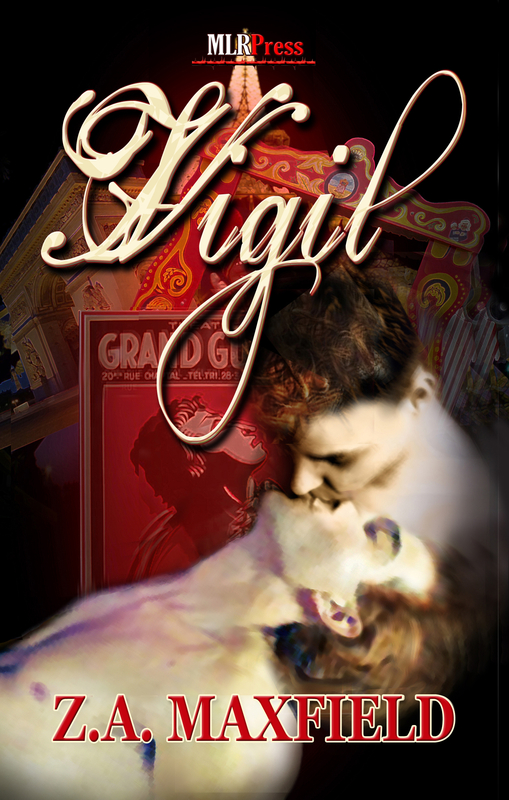 In other news, both Stirring Up Trouble and Vigil are now available at All Romance Ebooks. Last but not least, keep up with all things ZAM by checking out my LiveJournal, where I’ve been chronicling my NaNoWriMo experience (which hasn’t been easy peasy lemon squeezy because I’ve got two big edit deadlines in what seems like only minutes from now!) You can find me writing under my alter ego nom de blog, Abstractrx, HERE. Download Vigil to your Kindle Directly from Amazon Today! Vigil is officially LIVE! To get your copy click HERE.